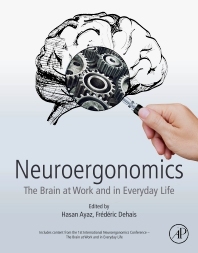 Neuroergonomics: The Brain at Work and in Everyday Life details the methodologies that are useful for keeping an ideal human-machine system up-to-date, along with information on how to prevent potential overload and minimize errors. It discusses neural measures and the proper methods and technologies to maximize performance, thus providing a resource for neuroscientists who want to learn more about the technologies and real-time tools that can help them assess cognitive and motivational states of human operators and close the loop for advanced human-machine interaction. With the advent of new and improved tools that allow monitoring of brain activity in the field and better identification of neurophysiological markers that can index impending overload or fatigue, this book is a timely resource on the topic. 4. Why is eye-tracking an essential part of Neuroergonomics? 12. Measuring the Redline for Mental Overload Using EEG and fNIRS: A Role for Neural Efficiency? 15. Is Mindfulness Helping the Brain to Drive? 17. Towards Brain-Based Interaction Between Humans and Technology: Does Age Matter? 30. The Assessment of Emotions and Decision Making in Everyday Living Using fNIRS. Dr. Ayaz is an Associate Professor of Biomedical Engineering at Drexel University, School of Biomedical Engineering, Science and Health Systems with adjunct affiliations at the University of Pennsylvania and Children’s Hospital of Philadelphia. He also serves as a core member of the Cognitive Neuroengineering and Quantitative Experimental Research (CoNQuER) Collaborative. Dr. Ayaz’s research focuses on understanding the neural mechanisms underlying human cognitive and motor functioning with emphasis on real-world contexts, mobile neuroimaging, and neuroengineering approaches for neuroergonomics applications. His research aims to design, develop, and utilize (i.e. to measure->elucidate->enable) next-generation brain imaging for neuroergonomic applications over a broad-spectrum from aerospace to healthcare. His research has been funded by federal agencies, corporate partners and foundations, and output over 200 publications in international journals and conferences. For over 17 years, he worked on the development of miniaturized optical brain monitoring systems focusing on imaging in natural environments and everyday settings. He has designed and developed multiple continuous-wave near infra-red spectroscopy instruments that are now in routine use for clinical and field research in hundreds of university, governmental and corporate research labs. As an extension to this, he led the software design and development of the first handheld optical-brain-monitoring medical device, Infrascanner, that received de novo FDA approval, utilizes near-infrared light to detect hematoma in head trauma patients, tested with 12 independent clinical studies with over 1,200 patients and currently deployed in 42 countries/6 continents in both civilian and military hospitals, already became the standard of care for children and sports medicine in some European countries. Dr. Dehais is a full professor at the Institut Supérieur de l’Aéronautique et de l’Espace (France) and holder of the AXA Chair in Neuroergonomics for Flight Safety, a rare credit attributed to less than thirty researchers in the world. He is leading the Neuroergonomics and Human Factors Department, a team composed of 18 members with an interdisciplinary expertise in Neuroscience, Signal Processing, Computer Science, and Human Factors. His research focuses on understanding the neural correlates of human error in real-life situations and the implementation of BCI and cognitive countermeasures to mitigate human error. His department receives substantial grants from European, National funds as well as Industry and his research led to more than 120 publications in international journals anc conferences. His innovative work has also led to five international patents. He has co-organized several national and international conferences such as HFES Europe 2012. He is also the co-founder of the European 2fNIRS portable brain imaging conference with Prof. S. Perrey and co-chair of the International Neuroergonomics conference with Dr. Hasan Ayaz.